Sunday, October 24, 1-4 pm: The Head Angels of Angel Hair Yarn Co., Pam and Andrea, have generously offered to open up the store for this event on a day that usually finds them at home, so this is a big treat. See! What a giant pile of afghan squares look like. Enjoy! Snax and bevs. Marvel! At how difficult it is to work with knitting while eating a Chee-to. Cross Your Fingers! That you’ll take home a door prize from my knitting vault. Monday, October 25, 9:30 am-1 pm: We’re gathering here at my house. 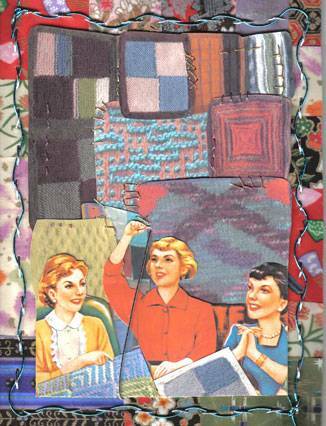 And frankly, I have invited some of my nonvirtual friends (to prove to Kay that I’m not as big a loser as she thinks/knows I am) who claim an assortment of sewing skills that is nothing short of TOTALLY LAME. You have never heard such apology, such self-deprecation, such worry over inadequate whip-stitch skills. This could be a long morning. We’ll start the event with a Doggone It I’m Good Enough self-esteem workshop and a burnt offering to Alice Starmore. Email me for directions–I’m conveniently located in Green Hills, less than a mile from Krystal. Hope you all can come by! PS Thanks as ALWAYS to Cristina for the sew-up art. Fantastic. Will be there in spirit [and in the flesh, well, at a family party!!] Love, love, love the invite. Christina, you are AMAZING!! And Ann, Love, Love, Love the blanket. What a Wonderful Time Capsule O’ Fiber!! How far of a bike ride do you think it is? Guess I’d better get packin’! Where did my “I [heart] Patsy” shirt get to, anyway? Like last time wish I could be there! Looking forward to the pics though and wishing you all a great time! Dear Ann, wish I could be there, too–especially for the lard. I’m not due until later in November, but this baby, according to the OB’s estimate is already BIG. It might be good for his second-in-the-birth-order self-esteem to top his brother’s 10lbs, 14 oz. (I know, TMI) and pork fat loading might do the trick. There’s a Cracker Barrel near the turnpike, but it’s just not the same–wait, no, they’re all disturbingly the same, but you know what I mean, I hope. Pleeeez do some instant fone-blogging for all of us who’ll miss the fun. I’ll see you ladies at Angel Hair since I have to wait for my hubby to get home from doing rounds! !